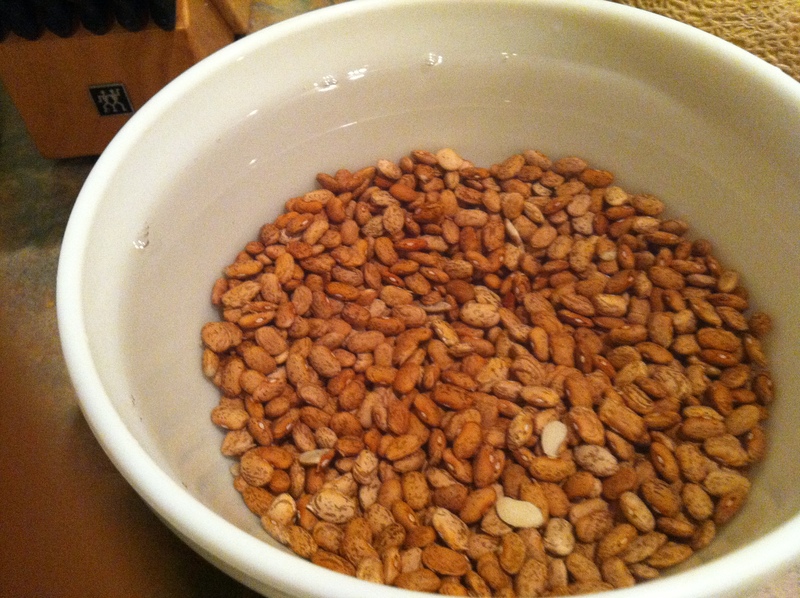 Several months ago, my husband bought a huge bag of pinto beans (25 lbs!). Since I rarely cook with pinto beans, I have been stymied. But, we like Mexican food, so my big idea has been to make refried beans. Unfortunately, that has failed on multiple occasions. Mainly, my failure has been due to not realizing how long the beans need to soak/cook. The first time I tried, I attempted to quick soak them in warm water, but they didn’t get soft enough to mash in time for dinner. The next time I soaked my beans overnight, but didn’t leave them time enough to cook and get soft, so they were firm pinto beans. Still not what I was looking for. This time I was committed. I soaked 1 lb. of pinto beans overnight. In the morning I drained and rinsed the beans, then put them in the crock pot with enough liquids* to cover the beans, adding water to fill the crock pot to within 3/4″ of the top edge. *The liquids included the contents of several nearly empty condiment jars in the refrigerator that my husband won’t let me throw out because he might want to use the juice someday – this included pickled garlic jalapenos and the juice they were packed in and pickled cactus bits, plus enough chicken stock to cover the beans. I didn’t turn the crock pot on until lunch time, on low. When I got home the beans were still too firm to mash, so I left them simmering on low overnight. By 8:30 am (we are into the third day now) the beans were finally soft. But I had too much liquid in the crock pot. I removed the lid and turned the crock pot up to high to reduce the liquid. After another 4-6 hours the liquids had reduced and I was able to mash the pinto beans. The bits of jalapeno, garlic and cactus from the condiment jars, added extra flavor and color. I did not expect this to take nearly 48 hours to complete, but at least most of this was passive, I didn’t have to watch it closely, and I FINALLY got my refried beans. Only 22 more lbs to go……. This entry was posted in Recipes and tagged crock pot, mexican, pickled cactus, pickled jalapenos, pinto beans, refried beans. Bookmark the permalink. You are more brave than I am. I was stumped by a 5 lb bag of pinto beans, and it ended up being a non-starter for me. I took it to the food bank. CSA Mom ~ I asked my Mexican friend at work about the pinto beans and she says she does not soak her beans. She said she cooks them for about 2 hours. Don’t give up on ’em! LOL! !